Palpitations are a sensation of a rapid or irregular heartbeat. A person with palpitations may describe their heart as ‘racing’, ‘thumping’ or ‘pounding’. Palpitations, especially in older people, are often generated by a heart problem such as abnormal rhythms of the heart, although some people have a sensation of palpitations just when their healthy heart is beating especially fast, during exercise or in anxiety. The abnormal heart rhythms may include in particular atrial fibrillation (fast irregular contractions of chambers of the heart known as the atria) and any abnormally fast heart rhythm. The overlying cause may be coronary artery disease (atherosclerosis of the arteries supplying the heart muscle) an overactive thyroid gland or depression. In younger, fitter people, palpitations are most often caused by stimulants such as caffeine, nicotine and alcohol, or by stress. Some drug treatments can cause palpitations as a side effect. Because they reflect an unusually fast heart beat, palpitations can cause the pumping action of the heart to become inefficient and delivery of oxygen to the body’s tissues may fall. This leads to symptoms such as shortness of breath, chest tightness or light-headedness. When this is the case, it’s important to seek medical advice as soon as possible. Avoiding whatever triggers the palpitations, for example caffeine, may help prevent them but investigation and treatment of the underlying condition may be needed. For example, a heart problem might be treated with medication; stress may be treated with stress management. There are a small number of specialist foetal medicine units where experts can help mothers and their unborn babies. In these units, the heart and circulation of the foetus can be examined by ultrasound, in a procedure known as foetal echocardiography. The advantage of these units is that when a cardiac malformation is associated with additional structural or chromosomal problems (as they often are) there are several different specialists available on the team to work together to provide the best care. If surgery is necessary, an appointment with the cardiac surgeon in the cardiology centre is helpful to prepare parents for the perinatal period (the time just before and after the birth) and to discuss surgical issues. Specialist liaison nurses provide additional support for parents at this time, and good communication with the local obstetric unit and local paediatricians is essential. Greater recognition and understanding of cardiac disease in the early stages of life should mean safer management before and at the time of birth leading to better results for heart babies. For example, treatments to open valves safely before birth are in development and fast heart rates can be treated using drugs. As our knowledge of the development of babies during pregnancy improves, doctors will be able to offer better care. Tiny Tickers is a charity aimed at improving our understanding of foetal heart problems. Its objectives are to raise awareness, promote research and support those affected by these problems. For more information, go to www.tinytickers.org. It’s thought that most heart problems in babies are due to faulty genes. From conception, when sperm and egg combine, a complex construction process occurs to create a human embryo. We all carry a small number of faulty genes and if there’s a fault in the gene signalling, a structural heart problem may appear. In small communities, where relatives are more likely to marry, there is less variation in the genes and it is more likely that both parents will carry the same rare genetic faults. This situation is known as a small gene pool, and it’s dangerous because genetic conditions such as heart abnormalities are more likely to occur. In larger communities, where there’s more mixing of different genes, genetic problems are less common. A proportion of babies with heart malformations have problems with the chromosomes, which can be detected by tests during pregnancy, providing an early clue that the child may be at particular risk. For example, many pregnant women are screened for Down’s syndrome (where there are three rather than two copies of chromosome number 21), in which up to 40 per cent of babies are born with a heart problem. There are other causes of congenital heart disease too. For example, mothers with diabetes have a two per cent chance of having a baby with a heart problem. However, most of the babies born with heart problems don’t come from high-risk groups. The reason is simply that this is a comparatively rare, almost unpredictable condition – and there are only small numbers of high-risk people in the population. The majority of heart problems in babies are detected at a routine ultrasound scan, usually at 18 to 20 weeks, although some aren’t discovered until after the birth. If you have worries, talk to your GP or obstetrician. If they suspect problems, they may refer you to a specialist unit for further tests. At about 19 weeks gestation, a baby’s heart is less than 1cm across and weighs only 1g or so (compared with 500g for an average adult heart). It also beats more than twice as fast as an adult’s. The circulation of a foetus is different from that of a newborn baby, being connected to a placenta and having three extra channels that must close or reverse at birth. Good-quality ultrasound equipment is essential to look at the tiny, fast-moving cardiac structures. Even so, ultrasound images appear grainy – it requires practice and an experienced eye to identify problems. Advances such as the colour flow doppler detect the movement of red blood cells, highlighting areas of abnormal blood flow that may indicate circulation problems. These may have been missed by a conventional scan. The causes are unknown, but it may be due to high cholesterol and fat levels in the blood, high blood pressure and smoking. Deposits build up on the artery wall, and may stimulate the cells in the wall to produce further substances adding further layers of blockage. Fat builds up around and within these cells causing narrowing, or stenosis. The inner layer of the artery wall thickens considerably, reducing the blood flow and starving the heart and/or brain of oxygen. A blood clot can also form, blocking off the artery completely. The arteries of the leg are often affected, as well as abdominal arteries and those near the pelvis – iliac arteries. This is called peripheral arterial disease. In tetralogy of Fallot, surgery may be needed to increase blood flow to the lungs with a shunt, linking the aorta and the pulmonary artery. The child is able to develop and the defect can be corrected later. An arterial switch operation may be necessary to reconnect the arteries correctly. With holes in the heart, oygenated, red blood from the lungs passes into the right side of the heart, where it mixes with bluish blood and is sent back to the lungs. The heart is put under extra strain, potentially causing it to enlarge and causing high blood pressure and blood vessel damage. Growth and nourishment are affected. Holes in the heart are closed with one or two patches and the single valve is divided into two. Blood circulation should be returned to normal but the reconstructed valve may not work normally. If the defect is too complex to repair in infancy, a pulmonary artery band may be surgically used to reduce blood flow and high pressure in the lungs (pulmonary hypertension). The band is later removed and surgery carried out. Balloon valvuloplasty, which involves threading a balloon through a dilated heart valve, is usually used to correct pulmonary valvular stenosis, although open-heart surgery may be necessary. 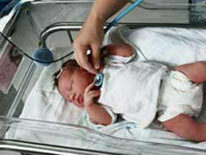 Diagnosis can be made by scans taken during pregnancy, but is usually made in the first days or weeks after birth. In some cases, however, diagnosis may not be made until much later in life. The holes are part of the circulation system in the foetus but should close up after birth. More complex conditions include tetralogy of Fallot. The main symptom is cyanosis, and for this reason babies with this problem are commonly known as ‘blue babies’. In tetralogy of Fallot, the baby has a large hole in the heart, allowing blood to pass from the right ventricle to the left without going through the lungs. There is a narrowing at or just below the pulmonary valve, the right ventricle is more muscular than normal and the aorta lies directly over the hole – the ventricular septal defect. Babies may have rapid breathing or fall unconscious. Older children may become short of breath and faint. An obstruction, or stenosis, can occur between the valves between the upper and lower chambers of the heart. More frequently, the obstruction is between the ventricles and trunks coming from them, either the valve to the lungs or the valve to the body. Only severe aortic stenosis requires surgery, and some children may have the condition without showing any symptoms. The obstruction can also be within the vessels themselves. In this case, the narrowing is within the artery and effects supplies of blood to different parts of the body. This defect may not be picked up for many years. About 30 per cent of children will, at some time, have an innocent heart murmur. But sometimes there are more serious problems with the heart. Congenital heart defects are present in about six out of 1,000 of babies. They take the form of holes between the chambers, blockages in the pathways from the heart to the lungs or the body, or abnormal connections between the chambers and vessels of the heart. Reducing the proportion of fat in your diet, especially saturated fat, can help to reduce blood cholesterol levels. There’s a strong link between high blood cholesterol levels and the risk of heart disease. For those who don’t have CVD or aren’t considered to be at high-risk of CVD, normal blood cholesterol levels are below 5mmol/litre. This can be measured by your GP. People with average energy needs should aim to consume no more than 70g/day of fat and less than 20g/day of saturated fat. Trans-fatty acids are a particular kind of fat that are naturally occurring in meat and dairy products but may also be produced when plant-based oils are hydrogenated to produce solid spreads, such as margarines. They’re often found in confectionery and processed food like pastry, biscuits and cakes. They’ve been found to have the same effect on cholesterol levels as saturated fat and should be avoided as much as possible. Thankfully, many manufacturers have now modified processing techniques to keep these fats to a minimum. Check labels for hydrogenated fats. When reducing total fat, it’s important not to cut out the heart healthy fats from your diet including mono and poly-unsaturated fats and omega-3, mostly found in plant and fish oils. Essential fatty acids such as omega-3s, which are found in oily fish, have been shown to reduce the risk of CVD by lowering blood triglycerides, reducing blood clotting and regulating heart rhythm. For general heart health, try to eat two portions of fish per week, one of which should be oily. Certain plant-derived compounds, called stanol or sterol esters have been shown to reduce cholesterol levels. Spreads, yoghurts, drinks and soya ‘dairy alternatives’ are now available containing these products. These sterol enriched foods may be particularly useful for those with raised blood cholesterol which has remained elevated even after making other dietary changes. Clinical trials show that when used regularly, they can reduce high cholesterol levels. Studies of large groups of people in the US have shown that diets rich in wholegrain food can reduce the risk of CVD by up to 30 per cent. You can include wholegrain food in every meal by choosing wholemeal bread and wholegrain varieties of pasta and rice. Soluble dietary fibre, found in oats, beans and pulses, can help to lower LDL cholesterol. These foods should be included as part of an overall healthy balanced diet, at least two to three times each week. A diet that includes at least 25g of soya per day has been associated with reductions in LDL cholesterol and CVD. Soya isoflavones in particular have been shown to reduce CVD risk as they inhibit the growth of cells that form artery-clogging plaque. Soya protein is also an excellent substitute for meat and is available in a convenient and tasty form in many ready-made meals. Another good source of soya protein is soya milk and yoghurt. The British Heart Foundation has an excellent range of resources giving information about reducing your risk of cardiovascular disease. While exercise can help lower blood pressure and strengthen your heart, rest and relaxation can reduce your levels of anxiety and improve your reactions to stress – both of which can affect the blood vessels and heart. All of us have to contend with major life events from time to time such as a divorce, bereavement, job loss or financial problems. However, there’s also a wide range of everyday events (being stuck in traffic, a row with your partner or a disagreement with someone at work) that can be stressful – and these everyday irritations may be even more stressful because they are constant. Keep a diary: make a note of stressful situations and how your react to them. This will help you identify what stresses you out, so you can begin to change your reactions. Stay positive: your thoughts control your feelings. If you stop and listen to your emotions, you may be surprised to discover how negative they are. Replacing negative thoughts with positive ones will help you deal with stressful situations more calmly. Learn to relax: pay attention to your posture and consciously relax physically. You may also want to try a technique such as yoga, massage, meditation or other complementary therapies. Get as much sleep as you need: we all need different amounts of sleep and you will know how many you need to feel refreshed. Try to get this amount of sleep most nights. Smoking and drinking are both linked with heart disease. But while there are no potential health benefits from smoking, moderate drinking can help to protect your heart. One of the most important things you can do to reduce your risk of heart disease is to stop smoking. Smokers younger than 50 are five times more likely than non-smokers to die of coronary heart disease. By stopping, you not only lower your risk of heart disease but also help reduce your risk of lung diseases such as cancer and chronic obstructive pulmonary disease (COPD). The key to successful quitting is to pick a method that’s right for you. For example, if you’re motivated by other people and enjoy their company, you may find encouragement and support by joining a group. If you prefer to go it alone, you may find it helpful to buy a book or tape. Your GP can prescribe aids such as nicotine replacement therapy or, alternatively, you may benefit from a complementary therapy such as acupuncture. Consuming moderate amounts of alcohol – between one and two units a day – has been found to reduce the risk of CVD. Alcohol can increase HDL cholesterol and makes it less likely that clots will form. However, high intakes of alcohol are associated with increased risk. It’s also worth noting that saving up your weekly units for a weekend binge doesn’t offer the same benefits. There’s no need to give up alcohol altogether but it’s important to drink sensibly. Always eat when you drink: take a tip from the Mediterranean countries and always have a meal or snack when you drink alcohol. Know your limits: To reduce the risk of coronary heart disease, don’t exceed 1-2 units of alcohol a day. A unit is equal to half a pint of regular strength beer or lager, one small glass of wine or a small (pub measure) of spirits. Watch your glass size: it’s easy to exceed safe limits by using a bigger glass. Mix and match: if you’re at a party or drinking socially, try to have a non-alcoholic drink for every alcoholic drink you consume. Once you’ve consumed your daily units, drink only soft or non-alcoholic drinks. People should also have regular blood pressure readings, height and weight monitoring, and tests for cholesterol levels. Those with high levels should be encouraged to improve their diet and can be treated for poor cholesterol levels with drugs – usually, statins or niacins. The American Heart Association recommends that blood pressure should be no more than 140 over 90 Hg. The association recommends a series of diets, with no more than 30% of calories coming in the form of fats, and limiting calories in the form of saturated fats to between 7 and 10%. Cardiovascular disease (CVD), is a group of conditions that includes stroke and heart disease. It kills one in three people in the UK. CVD is caused by a build-up of fatty streaks and cholesterol in the blood vessels. While some contributing factors can’t be altered, we can change our lifestyle. Natural wear and tear to blood vessels makes it easier for fatty cholesterol to leak in and get stuck to the artery walls. This build-up causes the arteries to narrow, reducing the heart’s ability to pump blood through them to the body. If they become completely blocked, it will cause a heart attack or a stroke if the blockage occurs in the brain’s blood vessels. Importantly, not all cholesterol is bad. There are two types of cholesterol in the bloodstream: LDLs and HDLs. LDLs create the build-up in arteries, while high HDL levels are a good sign that you’re not at risk of CVD. Restrictive cardiomyopathy is the least common form and occurs when the heart muscle of the ventricles, or myocardium, is excessively rigid, impairing the filling of the ventricles with blood between heartbeats. Tiredness, shortness of breath and swollen feet and hands typically occur. In another form of cardiomyopathy, the heart muscle is replaced by fibrous scar and fatty tissue. This may occur after a heart attack, where muscle is damaged – the right ventricle tends to be most affected. The right side of the heart may first thicken and later dilate – become thinner. It may lead to disordered electrical activity, and in some cases problems with the heart’s pumping action. Dilated, or congestive, cardiomyopathy is more common and occurs due to enlarging and stretching of the heart cavity, weakening the heart so it doesn’t pump normally. The heart muscle becomes weak and too flexible, preventing it pumping blood efficiently around the body. Because the heart is stretched or dilated, the valves may not close very well and may become leaky. Breathlessness results as fluid builds up in the lungs, congesting them. This is called left heart failure. There may also be right heart failure, where fluid accumulates in the tissues and organs of the body, usually the legs and ankles, and the liver and abdomen. Disruption of the heart’s electrical rhythm also often occurs. The cause of the condition is unknown in many cases, but it can be caused by infection with a virus, auto-immune diseases such as rheumatoid arthritis, excessive consumption of alcohol or, rarely, as a result of pregnancy – peri-partum cardiomyopathy. Shortness of breath, palpitations, tiredness, swollen ankles and angina are common symptoms. Blood clots often form because the blood is flowing more slowly through the heart. These clots may break free and move to the lungs causing pulmonary emboli or to the brain causing a stroke. Treatment may include anti-clotting drugs to prevent emboli, and medication to prevent arrhythmias and help the heart to work more efficiently. Any underlying cause should be identified and treated too. In severe cases a heart transplant may be necessary. The heart muscle thickens greatly (often asymmetrically) and the muscle cells may become disorganised (which can interfere with the passage of electrical signals through the muscle), without any obvious trigger. In most cases the disease is hereditary, resulting from a gene abnormality. The disease is thought to affect at least 125,000 people in the UK. In one form of hypertrophic cardiomyopathy (hypertrophic obstructive cardiomyopathy or HOCM) the muscle mass of the left ventricle and the wall that divides it from the right side of the heart (the septum) becomes larger than it should be. This leads to narrowing of the passage through the heart and obstruction of the blood flow out of the heart. In addition the muscle is stiff and has difficulty relaxing, increasing the amount of pressure required to expand the heart while blood flows in. This reduces the blood holding capacity of the heart. The altered structure may distort the mitral valve between the chambers of the heart (the left atrium and left ventricle) which may then leak. It’s also known as asymmetric septal hypertrophy (ASH) or idiopathic hypertrophic subaortic stenosis (IHSS). The condition can be present in the foetus and cause stillbirth, or may develop in infancy. But, more usually, it develops during childhood or early adulthood. In another form of the disease, non-obstructive hypertrophic cardiomyopathy, the enlarged muscle doesn’t obstruct the blood flow. The symptoms of hypertrophic cardiomyopathy include shortness of breath on exertion, dizziness, fainting and angina pectoris (angina is chest pain or discomfort caused by reduced blood supply to the heart muscle.) The obstruction to blood flow from the left ventricle increases the ventricle’s work, and a heart murmur may be heard. Some people have cardiac arrhythmias. These are abnormal heart rhythms that in some cases can lead to sudden collapse and death. Treatment, which includes anti-arrhythmia drugs, aims to control symptoms and prevent complications such as sudden collapse. Surgery may be necessary to remove some of the muscle or repair the mitral valve. A special device called an implanted cardioverter defibrillator (ICD) may need to be put into the heart to deliver and electric shock which will get the heart back into a normal heart rhythm whenever arrhythmias occur, in order to prevent sudden death. Because there may be a genetic cause, other members of the family should be screened to check for the faulty gene. Cardiomyopathy is a disease that changes the structure of the muscle tissue in the heart, or makes it weaker, so it’s less able to pump blood efficiently. Symptoms may appear suddenly with loss of consciousness, or there may be warning signs such as pain in the chest (angina), unexplained breathlessness or a rapid heartbeat (palpitations or arrhythmia). It’s important to treat streptococcal infections with antibiotics to reduce the risk of rheumatic fever, which can cause aortic stenosis, from developing. People with aortic stenosis are advised to take antibiotics before some invasive investigations (such as bladder cystoscopy) and surgical procedures to reduce the risk of heart valve infection (endocarditis). Some people with aortic stenosis are also recommended to take antibiotics before dental treatments for the same reason. Mild aortic stenosis is usually treated with medication, such as diuretics or ACE-inhibitors, to lessen the symptoms of heart failure. In more severe cases, a balloon may be inflated in the valve to widen it, called a balloon valvuloplasty, or the valve may be widened or replaced during open heart surgery. In the UK, aortic valve stenosis is the most common heart valve disorder requiring valve replacement. If the aortic stenosis is mild, there may be no symptoms at all, or tiredness may be the only symptom. If the stenosis is greater, other symptoms may include chest pain and/or breathlessness during exertion, palpitations, dizziness and fainting, especially during exertion. Heart failure may develop, causing symptoms that include tiredness, breathlessness and fluid retention in the legs, for example. In young people from developed countries, the most likely cause of aortic stenosis is a congenital heart abnormality. In older people, it’s commonly caused by a build-up of calcium deposits on the valve. In the past, rheumatic fever was a common cause of aortic stenosis. Normally, blood passes from the left lower chamber of the heart, called the left ventricle, through the aortic valve into the main artery of the body, the aorta. If the aortic valve becomes narrowed, or stenosed, the blood flow through it is reduced and the heart has to work harder to pump blood to the body. Aortic stenosis is more common in men. It can be present at birth but is more likely to occur in older people. Depression affects one in four people after a heart attack. It’s critical to address any depression – it won’t just go away on its own and it can make it harder for you to make any necessary lifestyle changes or follow your doctor’s advice on particular treatments. Without specific help, those who become depressed don’t recover as well as they might. If you take part in a cardiac rehabilitation programme, it will be able to offer treatments ranging from medication to group therapy and stress management (stress and anger may contribute to a heart attack by producing changes in your body that increase your risk of blood clots).